After a long sabbatical, I plan to post new snippets with some holiday recipes from around the world. May your upcoming holiday preparations be interesting and fun. Stay happy and healthy until I write again. Usually during this time of year, holiday tables are full of dessert pies made of a variety of fruit fillings. On our table for Thanksgiving Day is a variety of ethnic dishes including one for this Italian basic ricotta pie. 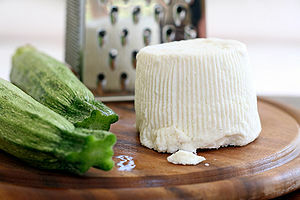 It’s very rich, but it can be made with part-skim ricotta to cut down a bit on calories. This is a quick and easy pie to make and should add a very distinct flavor to your holiday meal. For the crust, place 2 cups flour in large mixing bowl with baking powder, stir dry ingredients to blend. With fork, cut in margarine until small balls form. Add vanilla and slowly put milk in while blending with fork until ball forms. Add egg yolks and continue stirring until a large ball forms. If it is too dry to roll, add just a small amount of milk until of rolling consistency. Roll out dough onto waxed paper – one for top and one for bottom. Put half of dough into bottom of 10 inch pie plate. Reserve other half for top of ricotta pie. For the filling, in mixer bowl place ricotta cheese, egg whites, lemon and rind, mix. Then add the confectioners sugar and vanilla extract. Blend for approximately 7 minutes of medium speed or until smooth. Pour into pie crust. Place reserved pie crust on top of filling and crimp the edges as desired. Brush top crust lightly with egg white and place four small cuts to vent steam. Cover edges with aluminum foil to protect rim of pie. Bake at 425 degrees for 40 minutes or until lightly browned. For this post I don’t have to go far from home to remind me of the holiday season, of Thanksgiving and Christmas. I’m reminded of one day in the 1980’s when I toured the home of Lydia Maria Childs’ grandparents who had owned an old Georgian Colonial on the other side of the Mystic River in Medford, Massachusetts in the U.S.A. I had saved up enough money for a down payment on a house and Lydia Maria Childs’ grandparents old home was for sale. I toured the house with my husband and I was extremely excited by the prospect of owning such a wonderful piece of American history. I said yes to the real estate agents offer of a purchase price of only $42,000. 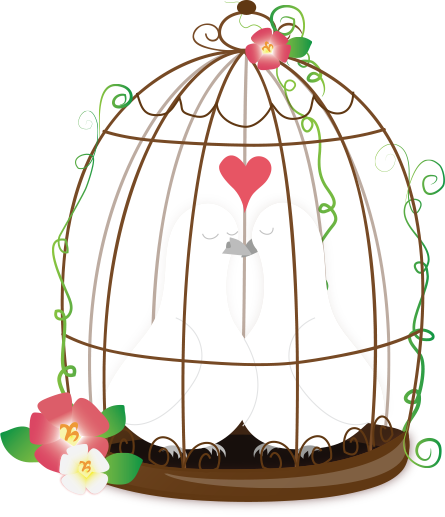 Unfortunately, after adding up the costs of owning and maintaining such a large structure, we decided against the purchase and moved on to other options. At a later date, Tufts University bought the home for a huge sum and the house remains on the U.S. Trust for Historic Preservations’ registered historic homes list. 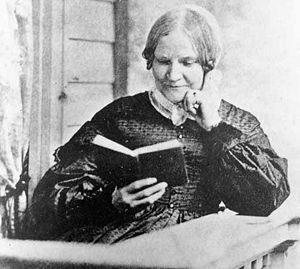 Lydia Maria Child was a author, abolitionist and activist who was born into a prominent New England family in Medford, Massachusetts. She was schooled in her early years in Medford Schools. She would often visit her grandparents at their home and wrote this song as an adult. Sometimes when the snow is deep and the air is chill, you can almost see the her sleigh coming across the old Craddock Bridge in Medford Square. Over the river, and through the wood,to Grandfather’s house away! it is so hard to wait! now Grandmothers cap I spy! Hurrah for the fun! Is the pudding done? Hurrah for the pumpkin pie! May your holidays be as filled with joy as the young Lydia Maria Childs’ was on that long ago Thanksgiving Day. In this salad I use the original beets as it lends a festive air to this Mexican style salad. If you want to use this for a dessert instead, leave the beets out. Fresh beets are best, but for ease of preparation canned beets may be used if thoroughly drained. Fresh fruit is preferred. Sugar is the only sweet added or it may also be served with a thinned mayonnaise. I like the following combination, but you can substitute a fruit ingredient for some other that you prefer. Sprinkle with superfine sugar (or granulated) or serve with thinned mayonnaise. This makes a wonderful dessert or dinner starter served before a holiday meal. 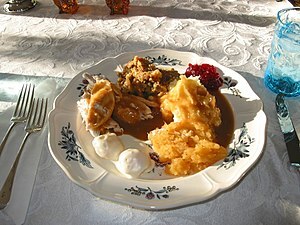 It is usually served as part of the Christmas Eve meal in some parts of the world. As promised, here is Aunt Julie Martins’ turkey stuffing recipe that was handed down for generations. It is a very simple stuffing and one that does not present too much of a challenge for the everyday cook. 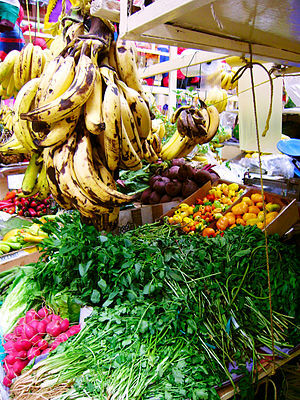 You can vary some of the add-in ingredients to suit your taste and mix them up for different flavor combinations. Put washed, dried and dressed turkey on rack in roasting pan. To prepare stuffing, tear bread into bite size, irregular shaped pieces and place in a stock pot, very large metal bowl or another roasting pan. Add the large finely chopped onion. Season stuffing with sage, rosemary, parsley, thyme, salt and pepper. Add salt and pepper and mix together well. Put in your choice of cranberries, raisins or dried apricot. Add chopped nuts. To this add just enough butter or margarine to moisten. Add a small amount of broth to this to moisten it just slightly more. Remember that the liquid from the turkey will permeate the dressing, giving it more volume. Stuff turkey with dressing. If you have extra mixture, stuff neck cavity by loosening skin to form a pocket. Cook as directed in previous post for Real Roast Turkey. After cooling turkey, remove stuffing immediately. Do not store finished turkey with stuffing inside. 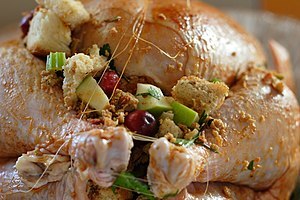 The internal temperature of stuffing should read 165 degrees on a meat thermometer. I hope you enjoy this turkey stuffing. We’ve been making it this way in my family for over 100 years. It’s very simple and straightforward. This is very good to use in turkey sandwiches after the holiday is over. Having been raised in the land of the Pilgrims and the first Thanksgiving feast here in New England, I know firsthand that we take our selection of a Thanksgiving turkey very seriously. It is that time of year again when the markets and supermarkets stock turkeys of all brands and varieties making selection a daunting task. I don’t have room in a small post to list everything there is to know about selecting, thawing and preparing a turkey dinner, but I’ll try to break down the process into several smaller writings. Here’s my familys recipe for roast turkey which is the way it was done by my great-aunt Julie. Preheat oven to 350 degrees Fahreheit. Remove giblet packet and neck from inside of cavity of turkey. Sometimes the neck is loose inside the neck cavity. Thoroughly wash turkey with cold water and place on counter on a platter and dry it completely with clean cloth or paper towels. Do not let the raw turkey touch surfaces of counter. Wash up behind yourself and periodically wash your hands with hot soapy water. Stuff the turkey with stuffing mixture and place on raised roasting rack in a deep sided large roasting pan. Baste the turkey with melted butter or margarine, then sprinkle liberally with dried herbs, salt and pepper. Pour broth and water into the bottom of the pan and cover with heavy duty aluminum foil, tenting slightly in the middle away from the top of turkey. Place the stuffed turkey in the oven on the lowest oven rack and roast for 5 1/2 – 6 hours. About 40 minute before roasting is complete, uncover the turkey so that it may brown. Cook for additional 40 minutes until turkey is golden. Remove turkey from oven and check internal temperature with meat thermometer. The thermometer should read 165 degrees when place in the thickest part of the thigh and, also, it should measure 165 degrees when placed in the thickest part of the breast. Stuffing, likewise should be thoroughly done at 165 degrees. Juices at leg joint should run clear. Let stand for 30 minutes. Carve and serve. My hopes are that you have a very happy Thanksgiving season. Aunt Julie’s Stuffing recipe follows in my next post. Here’s a quick recipe for a liqueur that can be used for any special occasion. I’ve found it an easy recipe to make and it is can be enjoyed after things have settled down after your holiday meal. 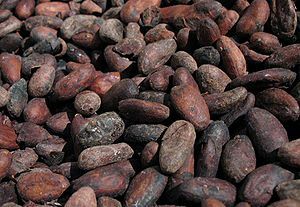 vanilla and chocolate extracts. 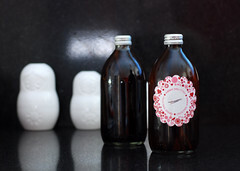 Pour finished liqueur into glass bottles with corks or into other fancy glass containers. Cover and let stand for 2 or more days for the flavor to develop. This is good served with a shortbread cookie or Biscotti’s.